Pioneering month closed out with a patrol competition on the 6 basic scout knots during our Knot Tying Relay Race! The grand finale of physical fitness month was the Troop 12 Olympics! This months Troop theme is " Physical Fitness" We went over the mechanics, and how the game of basketball, and soccer are played. Edison United Soccer Association donated some items for our meeting, the scouts had a contest on who ever can kick over the cone that the EUSA hat is on, will be theirs. We also had a visit by the Webelos II cubscouts from pack 318 , a scout from pack 318 had some good mechanics, and hit the cone. Congratulations to our winner. Troop 12 All-You-Can-Eat Buffet Breakfast! 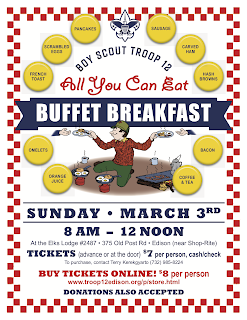 Boy Scouts Troop 12 of Edison is hosting its annual All-You-Can-Eat Buffet Breakfast at the Edison Elks Lodge #2487 (375 Old Post Road, Edison) from 8 AM to 12 PM on Sunday, March 3rd. Tickets are $7 cash/check in advance or at the door and $8 per person online. The event - featuring pancakes, sausage, made-to-order omelets, French toast, carved ham, fresh fruit and so much more - raises funds to support Troop 12's community-service projects, camping activities, and leadership training for the Scouts. Please show your support and join us for a delicious breakfast! Please enter all the names of those in your party if they are going to be arriving at a time other than the main ticket holder. Can't make it to the breakfast? Donations help pay for Scout supplies and equipment such as tents, lanterns, stoves and more. Thank you for your support! Practicing ice rescues at tonight's troop meeting!